Play On with Playtex Sports. I have a tween that is an unstoppable force. 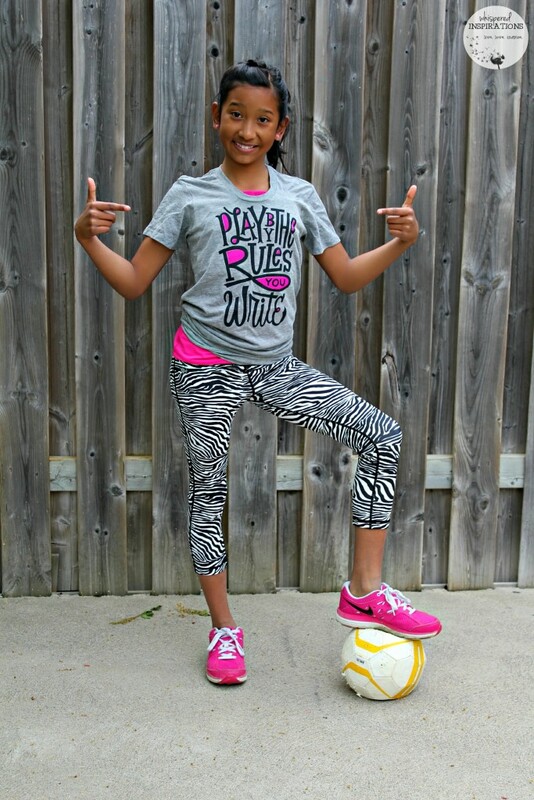 She is a budding track star, basketball fiend and soccer lover. That means she is always on the move. When the time comes, I know she will not let her period slow her down and she will play on no matter what! Being a mom of 2 girls, this is a subject that often crosses my mind. I want them to be educated, prepared so that they don’t run into embarrassing moments for lack of not knowing. 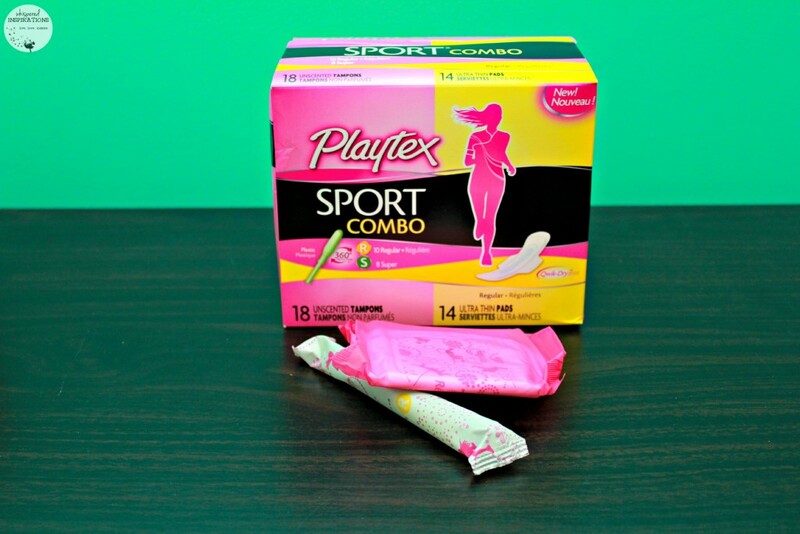 Luckily Playtex® Sport® has launched a NEW product that offers girls the ability to try different products all in the convenience of one box. Perfect for those just getting their periods and those that are looking for a little more variety. For those girls that are just starting their periods, I think the liner will work just fine until their flow increases. I love the fact that you get more than one product in a box! That’s already a huge plus for me. The pads are much more absorbent than the liners and I showed Gabs all of the options she has. The combo pack comes with pads and tampons. The older that Gabs gets, the more that we discuss body changes and what being a girl is all about. When she eventually grew curious when she saw my feminine products, she wanted to know why I used them and what the purpose was. She was in for a surprise but, since she was really little I didn’t go into much detail. Now that she has grown up and is getting closer to the age I was when I got my period, I thought it’d be the perfect time to let her in on all the details and leave room for discussion if she had any questions. I showed her the variety of products that she will use, explained to her that her period is the shedding of the uterine wall and all that jazz. Many giggles ensued with the use of V-word and she was satisfied with the answers and kinda grossed out all at once. Which is understandable! This kit is not sold in stores but, you can definitely make your own and add more things that your teen or tween will like. I think this kit is perfect for all the growing pains that periods bring. Why not make it the most comfortable you can for them? I know that when the time comes, she will not let anything slow her down. Playtex® Sport® are products that will keep up with her. From tween to teen and eventually a young lady. I am glad she will be prepared and so am I! 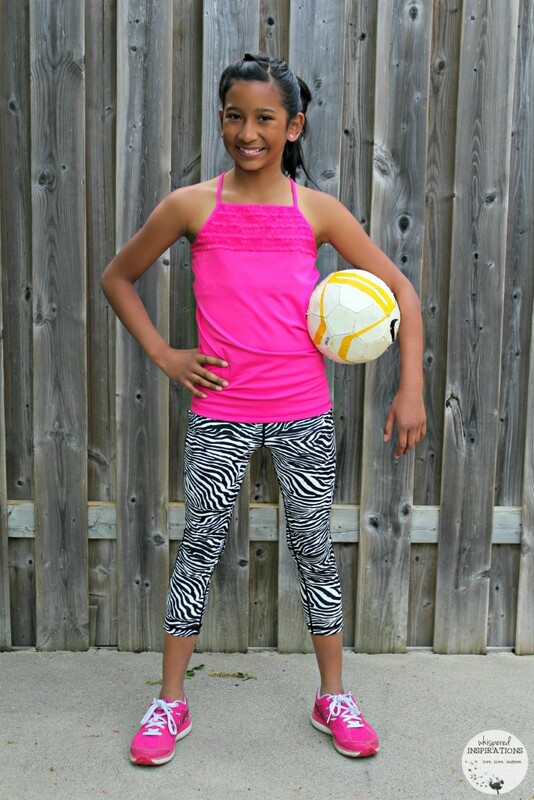 Playtex® Sport® is celebrating young women across Canada with an Instagram contest that asks girls to show how they Play On™. For additional information, follow @PlayOnCanada on Twitter or on Instagram at @PlayOnCanada and visit www.PlaytexPlayOn.ca. If you have teens and tweens let them know about this contest! 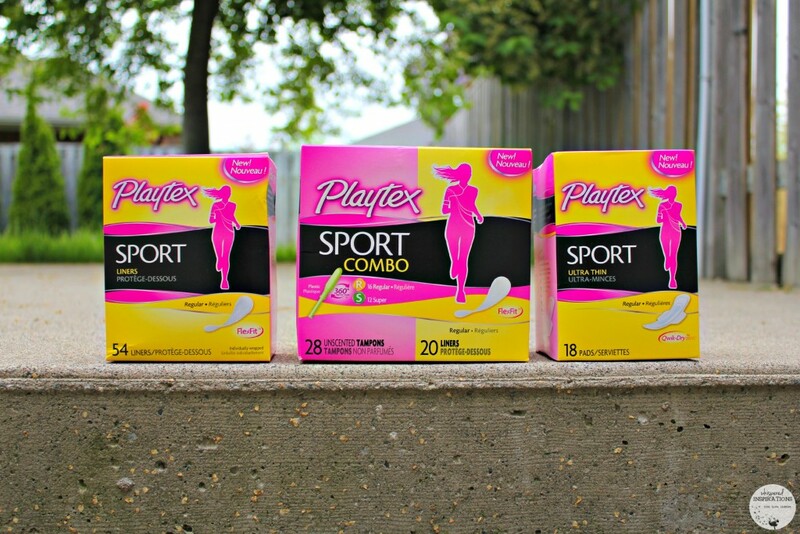 I’m sure it can go a long way and Moms, check out Playtex® Sport® for them and maybe even for yourself! Are you prepared for your daughter’s period? Previous Post: « To the Batmobile! Check Out Playtex PlayTime Cups with Twist ‘n Click™ Technology! Great organization and enjoyable presentation. Thanks so much for getting it done. I am not! But I will get organized now using your list as a guide. I am too. They have great liners and pads too! Things have sure come a long way since I was young. All we had were these HUGE, THICK pads. They sure have, yeah the big pads were embarrassing! Those look great. I wish these had been around when I was a teenager! This is so great. This can be an uncomfortable transition, so it's nice that there's something that they can feel confident wearing. I was just talking about this with a friend the other night whose daughter just started her period! My daughter is only 2 but will be this age before I know it…they grow so fast! This is great! My girls time will be coming soon. I’ve started talking to them about it too. I love player. It’s one of the few brands I use! It is a great brand. The products are awesome! What a great way to prepare your daughter for her period. I have a very active daughter and I'll tell her about the sports packaging. Love the photos and your daughter is so cute! Thanks so much, she loves to stay active! Your daughter is beautiful. It's wonderful you are talking about it now. As the mother of 3 girls I did the same with my sporty girls. It helps. They get so excited knowing the change is coming and the first time those cramps hit they are like I waited all my life for this ?? haha Still makes me laugh. Ahhh Cinderella not everything in a girls life is fun. Just necessary 🙂 Great post. LOL, thanks Laura. I think the more they know, the better. It can be a scary thing! You are so right! I think I am ready for the talk and getting her prepared. I'm glad that Playtex makes products that can keep up with active and athletic girls that aren't going to sit at home during that time of the month. We had the talk and yep, she is super active and I am glad there is a product that will keep up with them. Playtex is an awesome brand, it's great for sports! I can really see this being great for the younger girls. I wasn't actually there when my daughter started her first period. My husband was, and he handled it pretty well! However, having some Playtex on hand would sure have made things a lot easier! Playtex Sport Tampons are a great product. I have never been disappointed when i use them. I love this kit idea!! I know the day is right around the corner for me with my oldest for this day. That is such a cute shirt! My recent post 15 Cantaloupe Recipes For Summer! Thanks Jennifer, I love the shirt too. Wise words! The kit is helpful. I wish I was as confident as your teen when talking about things like this. I'm always private when it comes to that time of the month. For us, it is a natural occurrence. We do not usually announce it to the world but, it is a natural thing. My daughter is not older enough yet for this but I use Playtex Sports for myself. One of the brands that I can trust. I love how it keeps up with you! It will get them started and comfy! We just got this sample for my daughter in the mail yesterday. 🙂 Platex is a high quality brand. It sure is Rosey, love great quality. You have a very beautiful daughter and what a perfect model for this. My daughter is almost on that stage so this info would come in handy,. Thank-you so much! It sneaks up faster than we think! What an awesome post! 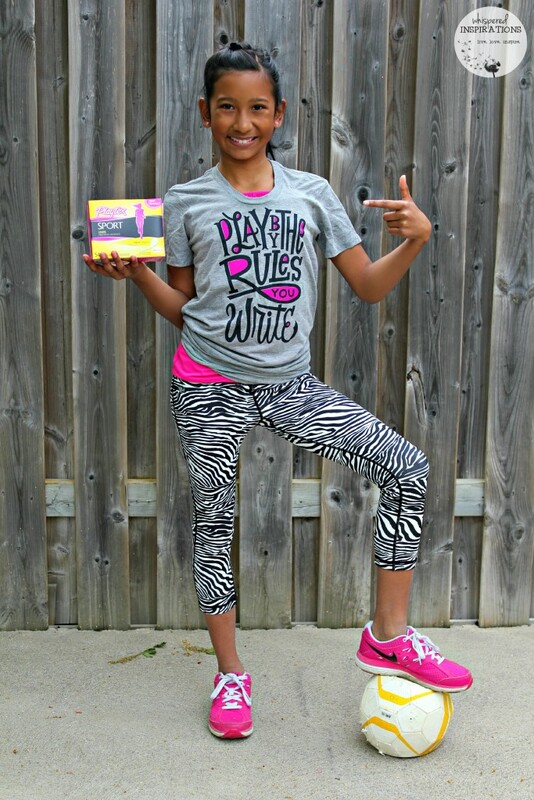 My daughter loves these products as well and won't use anything else. I love that kit you made. Thanks, they do work really well! I don't have teen girls, just two boys. A lot of my friends have girls so I am going to share this post with them! Thanks for a great article! Thanks so much, it is great to see a product that provides variety and comfort! What a lovely girl you have! I think it's so cool that Playtex is making products for active teens. I wish there were better options when I was younger! My daughter is far from that age, but I definitely need to think of something like this when she starts. I know, they have sure changed! Her pictures are adorable! I am not ready for this with my daughter. Luckily, I have lots of time. She's only 2! My recent post Who Else Could Use Self Care? That is so true! 🙂 Lots of time. I need to pick up those for my daughter! She's a soccer player. We've started talking to our 11 year old daughter about what to expect over the next few years also. Like your daughter, she's a sports animal so this is all very familiar to us. This looks like a good product to start out with. I think it totally is. It is great to know that there is a product that can keep up with them.